The entertainment district of Gion in Kyoto as seen from the steps of Yasaka Shrine. The street is flanked with a multitude of teahouses where customers could enjoy food, dance and music. Electricity poles already line the street. Kyoto’s electricity company, Kyoto Dento Gaisha, started operations in July 1889 (Meiji 22), so this photograph was taken after this date. 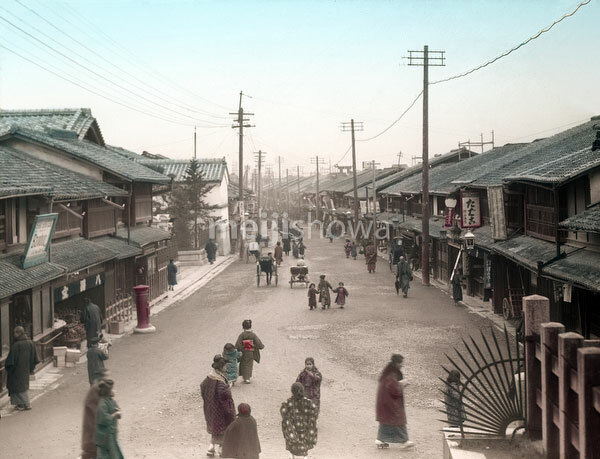 This street was originally about 5.5 meters wide, but it was widened to 9 meters in 1874 (Meiji 7) and to 22 meters in 1912 (Meiji 45). This completely destroyed the intimate feeling this neighborhood still expresses in this image.